The Mayors’ Council that governs TransLink has elected Vancouver Mayor Gregor Robertson as the chair of the ‘Yes’ campaign for the upcoming transit plebiscite and Surrey Mayor Linda Hepner as the vice-chair. A 0.5 per cent Congestion Improvement Tax (CIT) has been proposed through a consensus by the 23 municipal jurisdictions represented within the Mayors’ Council to help fund $7.5-billion worth of new and improved transportation infrastructure in the region. The new tax will be implemented as a sales tax within the Metro Vancouver region to most of the goods and services that are also subject to the PST. It is estimated that the CIT will raise $250-million ever year, which will go directly towards funding the underground extension of the Millennium Line under Broadway, a Surrey light rail network, a new Pattullo Bridge, more frequent bus service, 11 new B-Line routes and increased SeaBus frequency. Robertson and Hepner were likely chosen to lead the campaign given that they are the leaders of the region’s two largest municipalities, which happen to have the most stake in the plebiscite result. But if approved, funded and completed, the proposed infrastructure projects will have an impact that transcends individual municipalities. A formal launch of the ‘Yes’ campaign, including the release of a website, is expected in the coming weeks. Proponents already have the support of major business, labour, environmental and community organizations including the Vancouver Board of Trade, Unifor Local 111, Tourism Vancouver, David Suzuki Foundation, Downtown Vancouver Business Improvement Association, Downtown Surrey Business Improvement Association and the BC Chamber of Commerce. 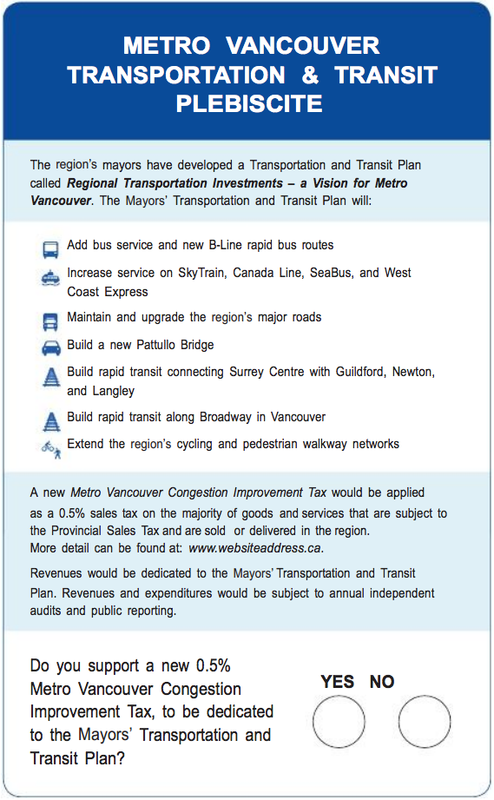 Meanwhile on Thursday, the ‘No TransLink Tax’ group led by the Canadian Taxpayers’ Federation officially launched its campaign with website that includes a 50-page platform that analyzes the Mayors’ Council’s claims and multi-billion dollar plan to cut congestion. In addition, instead of the CIT, the ‘No’ campaign proposes that regional municipal governments should dedicate 0.5 per cent of their revenue for the transportation investments. However, critics of the ‘alternative’ plan say increased municipal revenues cover the expenses that come with population and business growth. The upcoming plebiscite is a mail-in-ballot and will not be legally binding on the provincial government to approve the CIT should there be a ‘Yes’ result. While B.C. Transportation Minister has previously been a skeptic of expansion plans and proposed funding sources, he has recently stated that he will be a vocal ‘Yes’ supporter in the months to come.